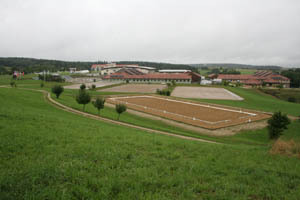 The venue is a large beautiful equestrian sport center in Rieden-Kreuth in southern Germany. 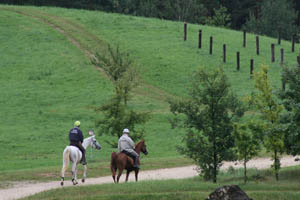 There are an abundance of stables, outdoor and indoor arenas, extensive riding trails, and hotel and apartments. 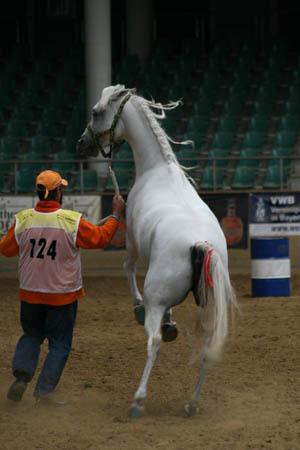 This is the 10th year of the Show and Sportevent for Arabian Horses, put on by the ZSAA – the German Arabian breeding association. 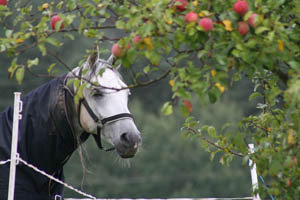 Competitions include show jumping, eventing, dressage, and Western competition, with endurance as the highlight. Ahmed Al Samarraie is president of the ZSAA and the organizer of Kreuth, and Samarraie has pulled this event off without major sponsorship. He makes it look easy. It either rained heavily, or threatened heavy rain throughout the day, so the decision was made to move the veterinary pre-inspection of tomorrow's entries into the large indoor arena. The humans and horses wouldn't melt, but the horse passports might, and there was no need to tear up the footing in the outdoor trotting lanes for tomorrow. There's a Polish team here to support one Polish rider, Artur Landau riding Hint in the Jr 80 km. Maciej (say “Machik”) Kacprzyk and Hannah told me there are only about 10 International Polish riders (it used to be better a few years ago), and maybe 30 national riders, and most of them are currently competing in Poland, so it's good to have a representative from the country here. Recently Polish riders have done very well in Germany and Hungary and Holland. Maciej is impressed with Kreuth, the area and the organization, and he's happy to see good international competitors came here, because it looks like it will be a good ride. One of my previous endurance hosts Stephane Chazel is riding for Team France in the 160 km ride. In addition to Jarmila Lakeman in the 120 km Junior ride, Netherlands riders Ingrid Langen is here with her gelding Amorin Star. It's his first time at such a big competition and he's not used to that, and since it was a long haul getting here, she's only doing the 80 km ride. “That's far enough for him this time.” They were out before the vet check, touring around and looking at the outdoor vetgates and crewing area, and the tents that might be blowing a bit if wind comes up tomorrow. Dutch rider Carla Romer is here with her good mare Fadilah R, who was raring to go during her trot out. 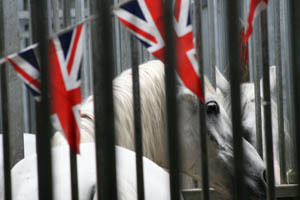 Or, I should say rearing to go, as she did most of her trotting on two hind legs! In fact she had to walk around a bit to calm down before she trotted out again. Jannet van Wijk is here also with her little gelding Latino for the 120 km. Both are ultimately aiming for the European Championships in Portugal in September. Margit Harman, Austrian Chef d'Equipe was here with a team of riders, 4 for the team 160 km challenge. Unfortunately, Daniela Entner's mare Kirim Karacbey did not pass the starting vet check, (they won the 120 km here last year) and that knocked the team out, leaving only France and Germany with teams. Margit said there's only about 100 Austrian riders, with maybe only 5 doing the 160 km rides. “We don't go so fast as the French... we just come to finish!” And enjoy the rides, I expect. 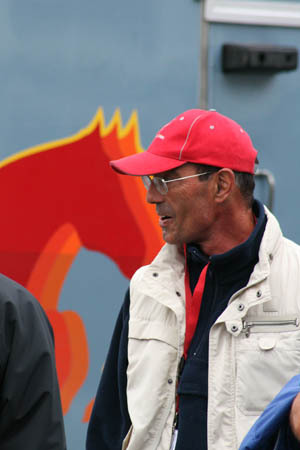 Fausto Fiorucci is here to ride the 160 km on his mare Veronica Cap. Fausto, 2001 individual and team Gold Medal winner at the European Championships in Perugia, and organizer of Gubbio, Italy, got a big round of applause at the ride briefing. The ride briefing was indeed brief, Al Samarraie getting right to the heart of ride matters and ending the meeting by 8:15, so his riders could all get sleep! It was a beautiful evening, just a quiet, light drizzle, with misty clouds drifting in and out of the forest, setting for tomorrow's Kreuth endurance ride.